The Scottish writer in India who has lived in India since he went there as a seeker in the 1960s, BILL AITKEN, wrote a book ('Sri Sathya Sai Baba') lavishly praising Sathya Sai Baba and - defending his now compromised position - wrote in his article (see below introduction here) in The Week (India) attacked critics and testifiers of sexual abuses and more besides in very defamatory terms. He was incapable of changing his faith so he ignoreed and brushed aside the massed evidence ae against Sai baba - who was protected from all legal challenges by the highest authorities in India (who worship him for whatever reasons - faith or politics, money etc.). This national scandal has become more and more widely known since Sai Baba's 'premature' death in 2011 (predicted variously by SB as not before the age of 93) from covered-up causes (death certificate issued was not legal as unspecific). "A year after the publication of this book, further evidence was to come that the writing experience and empathy with SSB had brought the stance of non-devotee Aitken closer to that of vigorous pro-Sathya Sai Baba campaigners in India and elsewhere, anxious to stand up for their beleaguered guru. In spite of his professed neutrality between “the hype of unhinged devotees and a howling pack of detractors”, some parts of Aitken’s eulogy, ‘Awareness of Divinity’, written for The Week (27 November 2005) on the occasion of SSB’s 80th Birthday, are no different, in essence, from what a Sathya Sai Baba apologist would assert, especially the blanket dismissal of all criticism as inherently baseless and extraordinary generalisations like “the critics are so intemperate in their dislike that their vituperation now comes across as almost near comical in its predictability”, as well as the permanent blind spot for serious Internet criticisms of Sathya Sai Baba that have not been refuted." Aitken has been promoted as "a religious expert", on nothing more than the basis of a Ph.D. (thousands write Ph.Ds on religion but are not thereby experts until they have published several monographs acceptedwidely in the academic world). He exhibits a great lack of knowledge and analytical ability, especially on the issue of whether Shirdi Sai Baba (Sufi-inspired) and Sathya Sai Baba (Hinduism promoter) represent the same teaching (hardly at all!) or whether it was convenient for Sathya (aka Narayana Raju) to usurp the Sai Baba name and his fame to begin to create his own following. That Aitken attacked all critics of Sai Baba as if they were all under one umbrella, incluing Prof. Narendra Nayak (see here) in such an ill-informed and untruthful manner as he did in ‘The Week’ also reflects very badly on his honesty and general competence. As Aitken wrote in ‘The Week’: “Recently, Marianne Warren published her Ph.D thesis, Unravelling the Enigma, arguing that since Shirdi Baba was a Sufi, Sathya Sai’s claims to be an incarnation of him are totally misplaced. This illustrates the limitations of the intellect and how the presumptuousness of scholars blinds them to the obvious fact that the mystery of rebirth is not open to proof one way or the other. He seems proud to assert a limited intellect, but some are more limited than others, especially on the issue of whether Shirdi Sai Baba (Sufi-inspired) and Sathya Sai Baba (Hinduism promoter) represent the same teaching (hardly!) or whether it was convenient for Sathya (aka Narayana Raju) to usurp the Sai Baba name and his fame to begin to create his own following. 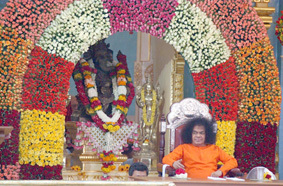 Any attempt at summing up the contribution of God-men to society—in modern India’s English media—is fraught with the prospect of either audience fatigue or cynicism, especially when the subject is Sri Sathya Sai Baba, an essentially vernacular figure (his biodata is available only through translation from Telugu). As a result, the views about Sai Baba’s place in the history of religion veer from one extreme to another. While one faction has a mass regard for him as the Godhead, the other crusading minority clamours through the sensational press to have his standing reduced to that of a common fraud. Obviously it is only from the middle ground, examined by objective, inquiring students of religion that Sai Baba’s status can be expected to emerge. But such neutral observers are thin on the ground. Having been a critic myself (of Sai Baba’s apparently inflated spiritual claims), I have found on closer examination over the years that my initial reaction was fairly normal and actually welcomed by Baba. I have been forced to revise my opinion and accept that this person does not say he is divine to the exclusion of others. What he says is that everyone of us has divinity within ourselves. He, however, unlike the rest of us, is fully aware of this truth. It is this sense of abiding awareness that many seekers (as opposed to casual visitors) experience in his presence that sets this teacher apart and makes him like no other spiritual phenomenon that I have ever read about or personally checked out in the 50 years that I have studied comparative religion. The theological contribution of the Sai saints has been to emphasise the equality of souls before God. The critical factor for determining his unusual spiritual aura, oddly enough, is crystallised by the darshan of his slight but remarkable physical presence. Sathya Sai exudes a rare grace that captivates any seeker who is after the real things the human soul hankers for. Between the hype of unhinged devotees and a howling pack of detractors, his diminutive figure appears the same today as it was when he was a boy—serenely established in a mood of unaffected humaneness. When asked how his students should dress, Baba replied with a subtle rebuke to today’s fashion of unconcern for other’s problems: "Dress in such a manner that no poor person in need of assistance will hesitate to ask you for help." The category of divine is impossible to qualify but people rich and poor, from all walks of life and different continents, confess that in the presence of this unlikely fuzzy-haired Andhra peasant they experience a grace that is like no other. Magically, it gives rise to an awareness within the beholder that he or she too possesses this priceless pearl of selfhood. This altogether mystifying personage, now celebrating his 80th birthday, is strangely untouched by his outer state of rags to spiritual riches story, and his inner state remains imponderable to all, except, crucially, to himself. Inevitably, most intellectuals who seek wisdom will shy away from the surrender of their shining minds, especially before a backward villager. Custom dictates that knowledge is power and the aim of life for most is to seek the polar opposite of love. The few (of all nations and conditions) who do foregather in Puttaparthi to celebrate the paramountcy of love are at one with their teacher and themselves. The observer gets the distinct feeling that the Bodhisattva or avatar (or any exemplar of human compassion like Sathya Sai) is the goal of human evolution. The greatest miracle on show at Puttaparthi is to witness this humble villager’s natural graces daily, which far exceed those of the so-called "most powerful man in the world" in Washington. The theological contribution of the Sai saints has been to emphasise the equality of souls before God. This theistic approach contradicts the paramountcy claimed by Sankaracharya for advaidic monism. Historically, south India has led the north in shedding the fatalistic notion that birth of the body decides the destiny of the soul. Both Sai Baba of Shirdi and Sathya Sai Baba of Puttaparthi have been revolutionary in preaching and practising spiritual egalitarianism, which is particularly relevant to India’s democratic policy still mired in a feudal mindset. It is significant that both Sai Babas have emerged from the Deccan where Dravidian influences mingle with the Brahminical, Islamic, Christian, Sikh and Humanist. For the student of subcontinental religious affairs it is fascinating to watch the cultural arm-wrestling as Shirdi Sai, originally presented as an anonymous Sufi in torn white kafni, is nowadays sought to be passed off as a sanyasi in saffron with a Brahmin pedigree. Having watched Baba for more than 30 years I have moved from my original position of intellectual doubter to that of a fascinated observer. I find he is a worthy understudy of Shirdi Sai and in my own pantheon of great beings, he finds a place alongside the Buddha and Christ. Recently, Marianne Warren published her Ph.D thesis, Unravelling the Enigma, arguing that since Shirdi Baba was a Sufi, Sathya Sai’s claims to be an incarnation of him are totally misplaced. This illustrates the limitations of the intellect and how the presumptuousness of scholars blinds them to the obvious fact that the mystery of rebirth is not open to proof one way or the other. As in all religious affairs, these things are personal matters and historicity is not as important to the heart as the feeling of oneness the two Sai masters engender. When truly in love the analytical mind is in abeyance. The controversy over Sathya Sai’s status has thrown up elements of the ridiculous at both extremes. His basic followers, Telugu farmers in the early days of his mission, sought to see miracles in everything the boy saint did. Chain letters were sent to stoke the impression of a cult of unbalanced believers, totally at odds with the teachings of Sai Baba—that you must weigh the evidence of a teacher’s spiritual worth before taking the plunge of faith to win his protective aura. When Professor Kasturi penned the official life of Sathya Sai (as the perceived avatar of Lord Shiva and Parvati), it was directed at a devotional, rustic audience. For the rational reader, the most authentic biography of Sathya Sai in English has been written by Howard Murphet, an Australian. The exponential growth of the Sai mission after his sole foreign trip to Uganda in 1968 saw a huge influx of overseas interest and funds. The dramatic expansion of the Prasanthi Nilayam ashram—with an international-class hospital, a deemed university and massive outlay of drinking water schemes for the drought-prone Rayalaseema district—helped the world to distinguish the universal compassionate nature of Baba from his earlier image of a miracle-mongering yogi. His unique, unchanging persona and the dynamic harnessing of goodwill that he arouses for social improvement make him much more than a conventional fund-raising mahatma. He is one of the few compassionate beings rarely seen on earth, concerned solely for the advancement of the human spirit. Sai Baba's concern for quality education and medicare is a positive input for nation building. At the other end of the spectrum is the violently vociferous lobby of local rationalists (convinced that Sai Baba is a confidence trickster) and international apostate disciples (who paint Sai Baba as the Anti-Christ). To add to the chagrin of these voluble detractors, who have criticised his career in print and on the Internet with malicious intensity for at least a generation, is the ongoing booming growth of his mission. The more they rail against the saint, the greater, it seems, is the number of people who flock to have his darshan. The critics are so intemperate in their dislike that their vituperation now comes across as almost near comical in its predictability. Nothing Baba can say or do meets their approval. If he provides drinking water to thirsty villagers they scent a scam but if he doesn’t provide drinking water he is anti-poor. The ground reality is that even Naxalites have welcomed Baba’s charitable intervention, recognising in him a fellow son of the Andhra soil. Often the impression given is that the vilifiers do not hate Sai Baba as much as they harbour contempt for the religious feelings of ordinary cultivators, whose devotion has made Sathya Sai what he is. Probably because of the intensity of their hate, when it comes to a serious, forensic examination of their allegations, they resort to bluster and evasion instead of hard facts. Smearing sexual innuendo is a traditional ploy but on failing to substantiate their charges, the critics switch to another unrelated subject. The strategy of the critics seems to be that if sufficient mud is thrown, some might stick. This hit and run behaviour suggests a neurotic concern to damn by any possible means. Certain foreign evangelical missions invest in these hate campaigns as a godly task while in international forums, pressure on voting patterns is discreetly applied by lobbyists of rival religions, to further their own cause. The latest in these so called exposes is a BBC documentary whose agenda was so predetermined to denigrate Baba that it stooped to the unethical use of a spy camera. In a last farcical gesture, the producer hired some roadside entertainers to attempt to simulate Baba’s chamatkar. The result is so ludicrous that it leaves the viewer wondering as to who is funding this bizarre display of hostile reporting. The BBC is ultimately governed by the Anglican establishment, and churches in the west are losing out financially to the appeal of the Sai Baba movement. As a commercial broadcaster, the BBC’s opting for sleaze would have the dual advantage of discrediting a rival as well as getting good audience rating. The Church of England can have no objection to programmes that weaken perceived threats—like the papacy or Hindu holy men—to its (declining) influence in the world. Posing as a lion in Asia, the BBC is a mouse in Britain. It dare not criticise public icons like the Queen, who happens to be the supremo of the Anglican church. Even negative assessments of the Sai movement have to concede that its growth has been phenomenal and that, remarkably, there has been no missionary effort involved. It has increased by spontaneous identification, where individuals have been drawn to the persona and teachings of the Sai saints, a voluntary outpouring of faith that has occurred in an amazingly short period. In appealing to the core of spirit that lies beneath the surface of all religions, the Deccan saints have not only made a dent in the fragmentary nature of the subcontinental religious loyalties but also restored the classical Upanishadic insight of the oneness of all faiths. This augurs well with the Indian democracy’s need to get beyond religious labels that have stultified its development since Independence. Baba’s concern for quality education and medical care is another positive input for nation building. The success of his peninsula drinking water network has proved that for efficient development, the crucial ingredient is sincerity of purpose. Bill Aitken is an expert on comparative religion and a travel writer. He is author of Sri Sathya Sai Baba: A Life. Traversing rocky mountains and never-ending plains to reach Puttaparthi, one does not expect gigantic film set-like buildings in this back of beyond. Bordering on the gaudy, the buildings—the hospital, the music academy, the university, etc.—painted mostly in pink, have a stamp of Sathya Sai institutions on them. Even the police station and the bus stand have temple architecture. Puttaparthi's economy is booming. Crises like drought or stock melt-downs don't seem to affect this over-grown village. Puttaparthi comes to a halt only when Baba moves to his ashram in Bangalore. Every business establishment here displays a picture of Baba prominently. Every establishment has 'Sai' in its name. Even to get a waiter's attention in a restaurant, one has to shout 'Sai Ram'. Beggars on the street call out 'Sai Ram' to passers-by. On the main streets, there is a significant number of foreigners. The economy revolves around these dollar-rich visitors. There are also several Kashmiris, who sell carpets and other handicrafts to foreigners. Some shops exclusively sell pictures of Sai Baba. Said one shopkeeper: "Ash could start falling from one of these pictures if you are lucky." Puttaparthi is completely vegetarian. Though not official, there is a ban on liquor. Young boys in white are a common sight here. They are students of one of the many colleges run by the Sathya Sai Central Trust. When asked what he wanted to become, a boy, who is doing B.Com., said: "I want to do MBA from our institution. Swami will guide me on what to become." Would he join a new-age company as an executive? "I am blessed if Swami asks me to manage one of his institutions," he replied. Students of institutions managed by the trust are forbidden from speaking to the media, he said. Although I grew up in an orthodox family, I questioned many of our traditional notions, particularly the caste system. Hence, I had difficulty in following a religious leader. I remember my parents paying respects to Sai Baba when they were unhappy. Since I loved them, I never criticised such things vehemently. But it was funny to see people getting rings and vibhuti from Sai Baba. It is cheap to make people believe in God through tricks. To believe in a phenomenon like Sai Baba is like losing my spiritual awareness. My friend's wife refused to undergo surgery for breast cancer on Baba's assurance that she would be cured. She died without an operation. It is wrong to advocate such belief systems because all of us will die. We must realise this truth. Once at the Hyderabad airport, Kannada writer Prof. V.K. Gokak, who worked with Sai Baba, was waiting for him on the flight I was on. Another well-known Kannada writer, V. Seetharamaiah, a traditional man with petha [turban], was sitting next to me. "What is happening?" I asked him. "The flight is delayed as they are waiting for Sai Baba," he said. Once Baba arrived, the crew and passengers, mostly vice-chancellors of prominent universities, bowed to Sai Baba and got vibhuti from him. "Why don't you go, sir?" I asked Seetharamaiah. "I'm an old-timer," he replied. Real old-timers didn't need a Sai Baba. I cannot understand how people are not sceptical about Sai Baba. One of the great Indian traditions is scepticism. Without this, Buddhism, Jainism and Veerashaivism would not have been born. India's true spirituality can be found in people like Kabir, Basava, Tukaram, Ramakrishna Paramahamsa and Ramana Maharishi. I don't know how to fit Sai Baba in that list. Between Sri Sri Ravishankar [Art of Living Foundation] and Sai Baba, Sai Baba is better because he is more easily available to the ordinary people. I recently watched Sai Baba on television and he looked old and sick. But there is kindness in his eyes. Many people are overcome with emotion when they meet Sai Baba. But that magnetism is not spiritual. People go to him for solace. Spiritualism is not solace but to seek truth, which is harder. Spiritualism requires a kind of mind like Jiddu Krishnamurti. I could argue with him. With Sai Baba, either you believe him or you don't. The 20th century is remarkable for three phenomena—hunger for social justice, hunger for spirituality and hunger for modernity. All the three went together. Mahatma Gandhi fought for social justice and tried to get out of the caste system. The spiritual streak in Gandhi emerged when he said 'Hey Ram' after he was shot at. Today, hunger for spiritualism has given rise to commercial gurus. Hunger of equality has degenerated into Lalu Prasad Yadav. Modernity has become globalisation. This is going to increase because of increasing rootlesness and a loss of a sense of community. I have no problem with a religious festival or even people taking the Ayyappa pilgrimage. Among Ayyappa devotees, there is a sense of community and equality. The problem is the hunger for persons like Baba. What puzzles me is that he claims to be God and I laugh at him. People also laughed at Lord Krishna when he claimed he was God. I used to wonder if Sai Baba is also God, and if we are refusing to acknowledge it. I like certain things about Sai Baba. When BJP leader L.K. Advani went on a ratha yatra, Sai Baba is believed to have said, why build Ram temple at Ayodhya when he is present everywhere. I appreciate his drinking water and health care initiatives. One more thing I like about him is that he is not an English-speaking person. The land that gave birth to great people like Gandhi and Ramana deserves better. The writer is a well-known Kannada writer and Jnanpith award winner. Asking about Baba's health can ruffle feathers at Prashanthi Nilayam. Especially if the question comes from a journalist. The secretary of the Sai Baba Central Trust refused an interview. A request for an interview with Baba was dismissed without a second thought. Information on his health comes 'off the record'. An inner-circle devotee, who did not want to be named, said that Baba was using a wheelchair ever since his thigh bone fractured in a fall in 2003. Surgery had not succeeded because of "rejection", he said. The devotee quickly added that as Sai Baba rarely travelled, the injury had not affected his routine. "In fact, all those who have been saying that the swami's health is failing are taking sick leave. He is as active as ever. He has not missed a single appointment," he said. Decades ago, Sai Baba said that he would "leave his present body" in 2022; that he would be reborn as Prema Sai Baba, in Mandya district in Karnataka. In July 1975, a boy, Sai Krishna, of Pandavapura in Mandya claimed to be Baba's next avatar. A fact-finding committee set up by the late H. Narasimhaiah, who was vice-chancellor of Bangalore University, proved that the 'holy ash' produced by Sai Krishna was hidden in the boy's vest, and that the pulling of a string delivered it to his palm. The organisation dismisses questions on who would succeed Sai Baba thus: "How can anyone succeed God? Baba is for ever." Said a member of the trust: "What is happening in Shirdi? Everything is continuing even after Shirdi Sai Baba. Here, too, it will go on like that." "Who can replace God? Baba was, is and shall be," said Baba's nephew R.J. Ratnakar. Would a certain Prema Sai Baba of Mandya inherit the empire? "That is not known to us," said Ratnakar. "It is known only to him [Baba]. It will happen if he has said so. How that will be revealed, only time will tell."